The Central Coast is at risk of losing its agricultural heritage to development. No plantings produce as valuable a crop as condominiums, and the pressure to sell agricultural land for conversion is almost irresistible for farmers. How can ag be preserved? Federal programs exist that benefit producers of wheat, corn, and other row crops, and a solution is to allow Central Coast agricultural receive those same federal benefits. The Department of Agriculture’s farm income support programs do not currently include fruits, nuts, and vegetables. It is time for them to cover farm products grown in our area. Far from having an unbroken history of support for crops such as wheat and corn, the farm commodity programs have embraced numerous crops, and also withdrawn support, as needs in the U.S. have changed. The Great Depression spurred farm price- and income-support programs. In 1937, large harvests of wheat and cotton cause prices to fall; the peril to farmers led to legislation that established mandatory annual price-support for wheat, corn, and cotton. That Act and the amendments that followed in the next few years allowed the federal government to offer price support on a discretionary basis for other agricultural commodities, including dates, figs, pecans, prunes, and raisins. In 1941, new legislation added peanuts and tobacco to the list of crops with mandatory crop supports, while 1942 placed rice on the list. During WWII, a new list of “crops” supported the war effort, included hogs, eggs, chickens, turkeys, milk, potatoes, and sweet potatoes. In all, over 140 commodities in total were supported during the war, but federal price support were cut way back in 1949. Basic commodities, like wheat, corn, rice, and cotton continued to receive support, while others were dropped. But new legislation added wool and mohair. Wool had been classified a strategic resources since in World War I uniforms had been made of wool. For some reason, mohair was added along with wool, offering the future potential for making soft scarves for soldiers. Support was made mandatory for tung nuts (used in paints and varnishes), honey, milk and butterfat, and Irish potatoes. The federal support for potatoes did not last, ending with the 1951 crop. The federal farm subsidies had encouraged overproduction, and the market price of potatoes had fallen. In order to maintain strong market prices, the USDA farm program purchased surplus potatoes. Faced with mountains of rapidly aging spuds, the USDA opted to discard them, first dying them blue to prevent consumption. When newsreel footage showed the surplus potatoes being dumped into the ocean, public outcry led Congress to remove potato production from federal support. While the farm support programs said good-bye to potatoes, 1952, however, reintroduced the extra-long staple, or Egyptian, cotton, used for premium dress shirts. This basic framework for the mandatory programs remained roughly constant from 1954 until the 1970s. Various discretionary programs expired (rosin, turpentine, and dry edible beans) while the mandatory tung nut program was eliminated. Production had so declined that by 1974 there were basically no more tung nuts being grown in the U.S. Since then, soybeans and the minor oilseeds (flaxseed, cottonseed oil, sunflower oil, canola, safflower, mustard seed, and rapeseed) became eligible for mandatory support. On the other hand, the honey, wool, and mohair programs were eliminated in 1990. It wasn’t until 2005 that the tobacco price support program ended. The 2014 Farm Bill created two new programs, the Agriculture Risk Coverage and Price Loss Coverage, which replaced the previous farm commodity programs. The two programs offer grower revenue loss and price-loss coverage, providing the landowners payment when revenue or market prices for the commodity fall below set values. In all, the agricultural income support commodity programs are expected to spend around $44 billion over 10 years. Only the crops included in the previously designed farm programs benefit, however, namely wheat, feed grains, rice, soybeans and other oilseeds, dry peas, lentils, chickpeas, and peanuts. 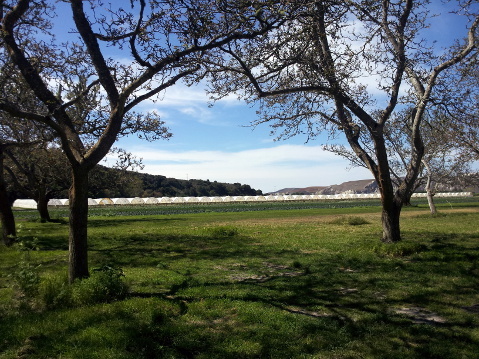 What are not included are the fruits, nuts, and vegetable crops that are the major crops grown on the Central Coast. Yet, these producers also experience the same kind of price and revenue fluctuation as other crops. In addition, California producers are faced with increased future water bills. Historically, there has never been a magical list of crops receiving farm bill protections. Crops have been added and removed over the years. The new farm bill commodity programs should be amended to make fruits and nuts eligible for the same federal support other crops receive.